FORKLIFT TRAINING & CERTIFICATION IS NOT AN OPTIONAL ACTIVITY! OSHA requires that all Employers Provide Certified On Site Specific Forklift Training for all Operators. Allied Toyota Lift, as a responsible and responsive vendor to our many customers and community partners, has invested in OSHA Certified Trainer’s so that we might assist you and your business in providing employees, customers, and visitors with a safer workplace to work in or visit. Most folks are not aware that annually approximately 100 fatalities and 94,000 forklift-related injuries are reported in the United States. To counter this distressing and expensive trend the Occupational Safety and Health Administration (OSHA) has completed its revision of the standards for requirements for forklift operator training. OSHA Standard 1910.178 details and lists the safety and health standards for operators of materials handling equipment as they relate to the operation of powered industrial lift trucks in business. Please keep in mind that formal forklift training in a classroom along with practical hands-on training and an evaluation is now required. 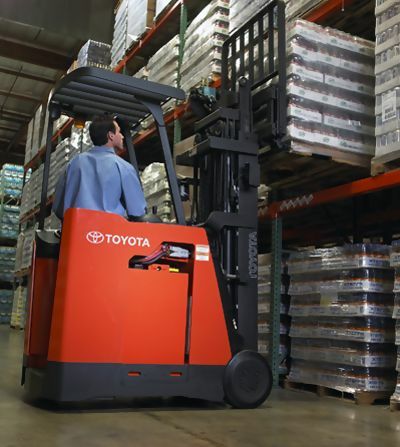 Allied Toyota Lift offers a comprehensive training program approved by OSHA to meet this OSHA regulation. Allied Toyota Lift trainers are certified and insured against any possible legal problems. Is your current trainer? You should know that and have paperwork on file. And we also conduct classes to train operators as well as offering train-the-trainer certification for customers who want to train their own operators. Up to date and current training materials are available for use by your trainers. Visit OSHA’s website at www.osha.gov to learn more for yourself. Our OSHA Approved and Certified Forklift Training & Safety Programs include videos, manuals, exams, and a wide variety of training aids. Your operators will not be bored and will learn important skills to help make their workspace a safer and more productive environment. Call today for pricing and scheduling information in Knoxville at 865-573-0995 or Johnson City 423-282-6041 for full detail on our forklift training services!